Description: Ayahatori-that is the given name of the family possessing a mysterious power. They have the power to be able to summon and use beings and people from secret ancient writings. During the Ayahatori initiation ceremony, high schooler Kozakura Saaya summons one of the three most beautiful women in the world, Ono no Komachi. However, what appears in front of her is a man with matchless beauty-!? 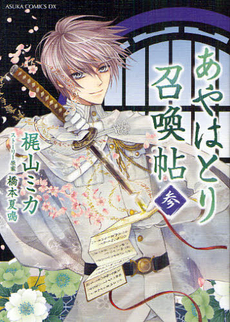 The story is ambiented in a feudal scenary: Masanaru Wafuu Gensou Kitan. “Woven Stament” (Aya wa Tori) is the name of a family with magical abilities is known. The family got their magic thanks to some secret archivies and uses it to summon people. 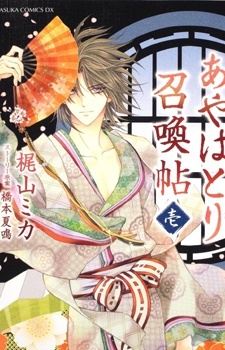 Some day Kozakura Saaya, our heroine, get noticed the statement conferred full mastership for those who possess it and it becomes a real deal when one of the three most handsome guys of the world appear: Komachi Ono, and Saaya use the statement to… be beautiful to be attractive to Komachi Ono!! This entry was posted in Ayahatori Shoukanjou and tagged KAJIYAMA Mika. Bookmark the permalink.